Structural movement joint in a choice of aluminium or stainless steel, with a replaceable movement zone of 20/30mm, made of soft rubber. Retrofit structural movement joint made of aluminium, with a sliding telescopic centre. Suitable for handling movements of ± 5 mm on a three-dimensional basis. Common uses include warehouses, shopping centres, airports, train stations etc. 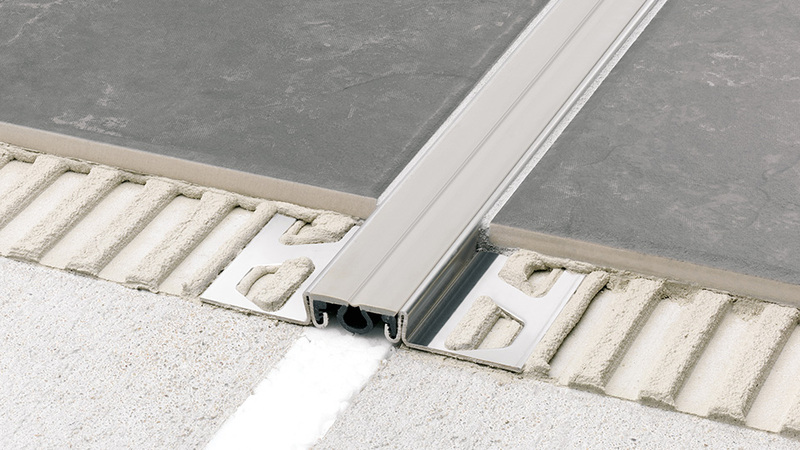 Structural movement joint made of aluminium, with a sliding telescopic centre, installed at wall to floor transitions. Suitable for handling movements of ± 5 mm on a three-dimensional basis. Common uses include warehouses, shopping centres, airports, train stations etc. Structural movement joint made of aluminium, with a sliding telescopic centre. Suitable for handling movements of ± 5 mm on a three-dimensional basis. Common uses include warehouses, shopping centres, airports, train stations etc.